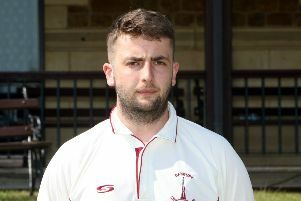 Oliver Clarke hit an unbeaten half-century and took three wickets as Banbury got their ECB National Club Championship campaign off to a winning start. Lloyd Sabin’s side beat Romsey by nine wickets in Sunday’s Group 12 first round fixture. Sabin elected to field and Banbury took wickets at regular intervals to dismiss the hosts for just 98 runs in the 37th over. Graham Beer took 3-17, Clarke picked up 3-21 and Sabin took an impressive 3-16. In reply, Banbury soon got the job done in less than 22 overs. Sabin hit an unbeaten 31 runs, which included four fours, off 49 balls while Clarke remained unbeaten on 54, hitting five fours and a six, off 72 balls as they guided the White Post Road side home without too much trouble. Banbury now face a trip to Peterborough in May in the next round of the competition. Banbury travel to Amersham on Saturday for their final pre-season fixture ahead of the new Home Counties Premier Cricket League campaign. Meanwhile, former Banbury seamer Liam Manley will be plying his trade with Horspath this year after leaving Great & Little Tew.